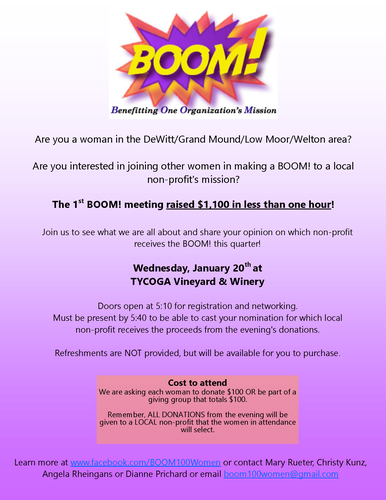 - Are you a woman in the DeWitt/Grand Mound/Low Moor/Welton area? - Are you interested in joining other women in making a BOOM! to a local nonprofit's mission? - The 1st BOOM! meeting raised $1,100 in less than one hour. Join us to see what we are all about and share your opinion on which non-profit receives a financial BOOM! this quarter! Refreshments are NOT provided, but will be available for you to purchase. Monday, January 14th. Doors open at 5:15 for registration and networking. Must be present by 5:40 to be able to cast your nomination for which local non-profit receives the proceeds from the evening's donations. Mary Rueter, Christy Kunz, Angela Rheingans or Dianne Prichard. We ask each woman to donate $100 OR be part of a giving group that totals $100. ALL DONATIONS from the evening will be given to a LOCAL non-profit that the women in attendance select.